A total of 10 thousand spectators witnessed the action stage, Justin Bieber tonight in the series "My World Tour" it in Indonesia. Located at the Sentul International Convention Center, he managed to anesthetize the audience is predominantly young women. Opening concert with the song "Love Me", Justin was wearing a white jacket and pants. Lacks music from disc jockeys and four dancers, he made thousands of spectators hysterically screaming his name. Canadian singer was also demonstrated that mixed martial arts action with a dance. After the song "Bigger", Bieber also greeted the audience. "Hai Indonesia. I'm happy to be here. You know, I do anything to be here," Justin said on stage. He continued his concert by singing "You Smile" very good. While singing the song "Runaway Love", Bieber opened his jacket. Wearing a purple shirt and hat, which is her favorite color, he amaze the audience with breakdancing movement. 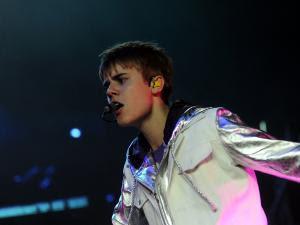 In concert this time, Bieber also performed the song "Never Let You Go" acoustic version. Also played a video of Justin Bieber's childhood at the age of three years, after he performed the song "Favorite Girl" and "One Last Lonely Girl". In the video it looks fun little Bieber playing guitar and singing. Bieber hits "Never Say Never", "One Time" and "That Should Be Me", the display with stunning stage act. Again and again he displays expertise and kekompakkannya dance together with the background dancers. No wonder thousands of spectators back hysterical look at the action stage. He also showed skill in playing the drums. For three minutes he was doing the drum solo. The song hits "Eeeme Meenie," "Pray" and "Baby" became the perfect closing concert tonight.